• Total video game software sales exceeded $24.5 billion in 2016. • In 2015, there were 2,457 video game companies operating at 2,858 locations in all 50 states. • The total direct employment by the U.S. game industry now exceeds 65,000 employees. • The total employment that depends on the game software industry now exceeds 220,000.
contributions for pensions, insurance and government social insurance) was about $97,000. • The U.S. game company industry’s value added to U.S. GDP was more than $11.7 billion in 2015. The California Chancellor’s office names 3D Animation as a program to watch! According to the Chancellor’s office from 2014 to 2024 there will be 740 new job openings each year in California for Animators! Sales of video games and consoles each year continue to eclipse the market for movies, both in ticket sales and purchase of DVDs. The video games industry has become big business and now encompasses not only the Playstations and XBOXes in living rooms, but smartphones and tablets where people can play anywhere, anytime! 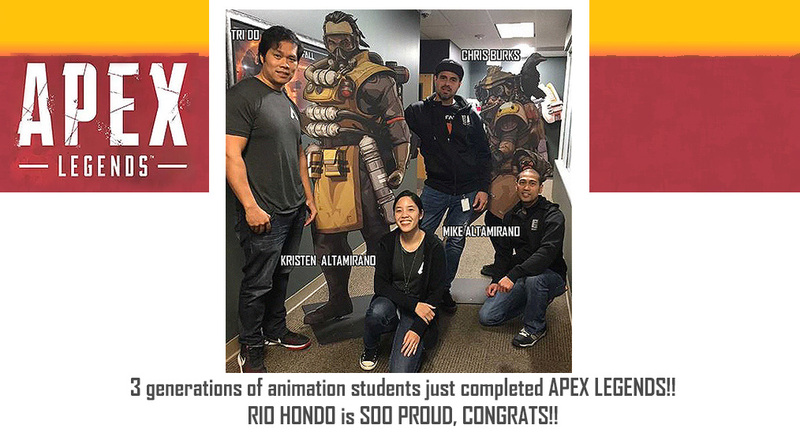 Rio Hondo’s Animation program is guided by Industry Professionals from local game studios. Each semester students have an opportunity to get to know people working in the Entertainment Arts through workshops, Panel discussions and lectures.